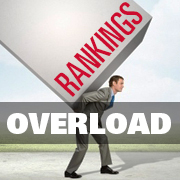 Rankings Overload: Which surveys are right for your firm? Law firm rankings and surveys are nothing new to legal marketing professionals. We all get inundated with notices about upcoming opportunities on a regular basis, in part because the sheer number of surveys and rankings for law firms and their attorneys has grown exponentially in the past few years. This leaves many marketers with the overwhelming task of determining the value of each ranking to their firm. Getting an accurate count of the number of law firm rankings is no easy task. Jaffe annually tracks a whopping 1,200 rankings and their corresponding submission requirements. And while that’s a large number, that does not include the 500 rankings/surveys that have been discontinued since we started monitoring this area. It also does not take into account the surveys that are sent to law firms that are not well-vetted. Deciding which law firm rankings are worth pursuing is not an easy task, and it’s one that vexes rookie and veteran legal marketing personnel alike. Last month, I attended the Law Firm Media Professionals meeting in New York titled, “Surveyed Senseless – How Legal Media are Ramping Up Industry Contests and What to Do About It.” As the title suggests these law firm media relations executives met to discuss the onslaught of attorney/law firm rankings and how their firms are responding. These executives face two overriding issues. First, not surprisingly, they wish they could tame the volume of rankings they are faced with completing. But, second, law firm media relations professionals often don’t feel rankings are a valuable tool in their media relations arsenal, and yet the attorneys they work with want to be included on the rankings. Let’s tackle that second issue first. Arguably, rankings do serve a purpose in a law firm marketing/PR plan. Once the firm has determined what its marketing goals are for the coming year, the right rankings can enhance the firm’s market position. In addition, firms should not discount the ripple effect a ranking can have on their online visibility. In these days, when potential clients have greater choices than ever when retaining counsel, being on the right industry ranking could tip the scales in the firm’s favor. When all things are equal, the attorney with greater industry recognition is often chosen. Remember that as you create guidelines to help you determine which rankings to pursue, your parameters should be broad enough to account for the changing market as well as new awards/rankings. Additionally, the guidelines would not necessarily be the same for each practice group. This is not one-size-fits-all solution and needs to recognize the differences between practices. Rankings and survey are here to stay. It falls on each of us, the legal media professionals, to research and vet which add value to the firm and which can be passed up. Want to know which law firm rankings are the best fit for your firm? Contact me, Susan Holmes, at sholmes@jaffepr.com. Manager, RankingsForLawyers - Helps clients achieve their business development goals through rankings successes.